Tune in on Sunday, May 15 as Tracey launches International Coaching Week with a live interview on NewsTalk 770 in Calgary and 680 CJOB in Winnipeg. 3:15 pm MST. We made it! In fact, we were the first of 82 teams to finish, collecting a wee little trophy. Hooray! There will be many stories to come once we are back in the land of easy internet accessibility, but for now check out The Jibber on The Adventurists site. After about 5 days without phone or internet connectivity, we’ve re-surfaced, in Darjeeling. Today’s climb of 8,000 feet was interesting. Tracey and Richard needed to hop out and push up the steepest bits while Miles navigated the switchbacks like a pro. When we reached the washed out road, a half dozen road workers picked up the entire rig and carried it safely to the other side. Now nestled in the middle of Nepal, Tibet, Butan & Bangladesh, it feels like we’ve left India entireley. 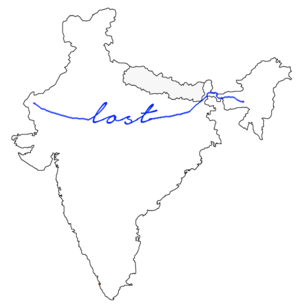 Tomorrow we start the descent and head to Assam. We leave our cats and home in good hands and head to India for the start of a grand adventure. Arriving in Delhi feels like stepping back in time as we disembark the ultra-modern Airbus 830 and head into the very early morning streets of the city filled with thousands of cows, goats, dogs and people…hundreds of people…wrapped in blankets and sleeping on the sidewalks. At the train station, we have a brief opportunity to visit with our friend Abishek who has come from his home in Udaipur to meet up with us. He’s been a great help in getting us ready for this trip and we’re disappointed that we can’t manage more time together. 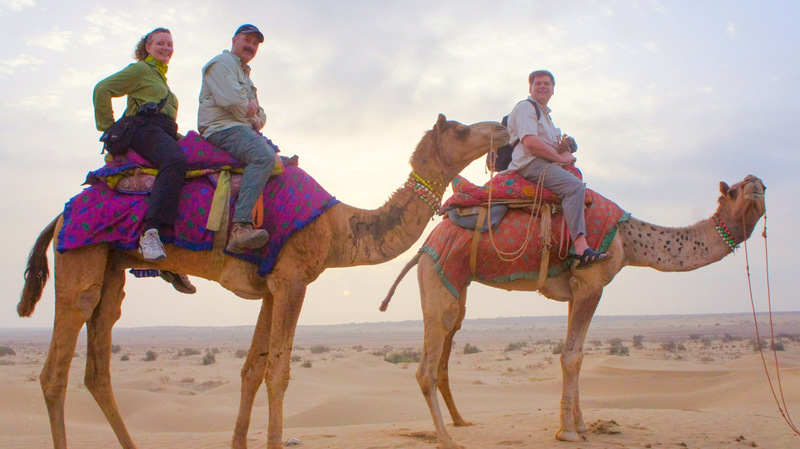 Before we know it, we’re stepping onto a crowded, dusty train for our 18-hour journey through the state of Rajasthan to Jaisalmer, near the Pakistani border. As the sun rises, we are immersed in the sandy, scrubby scenery that we will face for several days once we begin our drive back across the country for the Rickshaw Run. After a good night’s rest in our abode for the first six days of the trip, the Nashna Haveli, we’re off to explore the spectacular hill fort, a UNESCO World Heritage Site and the only fort in India to still be inhabited. In the sweltering heat of the afternoon, we return to the haveli, former home to several Maharajas, to be greeted by the Prince. He still lives here, along with his sister, brother and each of their spouses and children. We truly feel like guests in their home as we dine on their ancient family recipes sitting alongside them on the rooftop patio enjoying spectacular views of the fort and surrounding city. 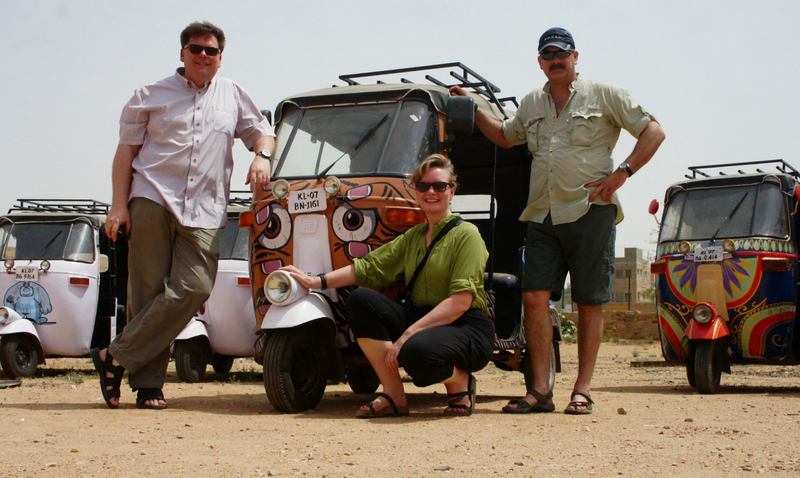 The next morning has us up long before sunrise and heading into the middle of the Thar Desert for a camel safari, exploring an abandoned city and hiking through the Royal Cenotaphs. After a fantastic thali for lunch, we are off to the Rickshaw Run headquarters and finally have an opportunity to be face-to-face with our auto rickshaw. We chat with the painter, Amrit, who patiently spent two days duplicating the fabulous rickshaw design created for us by Mark Cromwell back at home. He’s done a fantastic job and all that he will accept from us as a token of our gratitude is a Canadian coin to add to his collection. 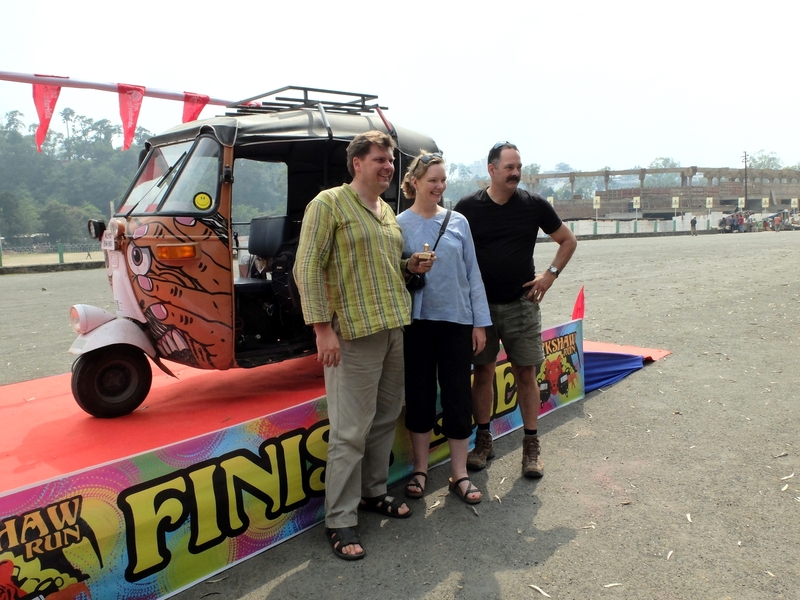 The next few days include lots of opportunity for vehicle modifications and test driving before the Rickshaw Run kicks off on April 6. Beginning to get acquainted with our little motorized beast, I squeal with delight when I actually manage to muster the super human strength to get the engine going using it’s crazy pull lever starter. The rest of the operation is pretty much like a motor bike and Miles, Richard and I all pick it up quickly, receiving our official auto rickshaw/lawnmower permits without much effort. It’s looking like we’re almost ready to roll off into the great Indian unknown.